•	Promotional deals, discounts, and special quarterly and seasonal sales events, not to mention clearance sales events, are going to be published directly on the homepage of the MadVapes.com website. These deals are refreshed routinely. •	Individuals that are looking to take advantage of exclusive savings opportunities, including discounts that can be applied to entire orders at a time, are going to want to consider signing up for the free email newsletter program published by the MadVapes.com company. This email program entitles members to exclusive offers, coupons, and promotional codes shared nowhere else. •	Take advantage of free shipping offers that are published on the home page of this website from time to time. These deals are good for standard delivery to addresses in the United States. 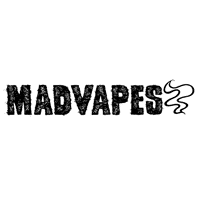 Madvapes offers electronic cigarettes, vaping gear, and much more. Deep discounts are frequently offered on their products, which can include mods, devices, batteries, chargers, tanks, RDAs, replacement coils, accessories, e-liquids, and more. You can find device kits, which includes introduction kits. Cuttwood, Charlie Noble, Conspiracy, and Action Fluid are some of the brands you can find with e-liquids. DIY e-liquid supplies are also included. 18650 is just one of your options with batteries, and there are also a number of categories broken down by flavor. Top coil and bottom coil possibilities can also be explored, in addition to drip tips and cases. For most up to date offers check out Madvapes on Facebook and Twitter or contact Madvapes Support for any questions.